William Penn issued the Charter of Priviledges, which many historians believe was being celebrated 50 years later with the ordering of what would become the Liberty Bell. Construction on the state house began (see next). Construction on the state house is completed. This was Colonial America's grandest public building and would be home to the Liberty Bell. At this time, however, the building had no bell. The Assembly, "Ordered, That the Superintendents of the State-House, proceed, ... to carry up a Building on the South-side of the said House to contain the Staircase, with a suitable Place thereon for hanging a Bell." The Pennsylvania Assembly issued an order for the bell. Isaac Norris, Assembly Speaker and the Chairman of the State House Superintendents asked the Assembly's agent in London, Robert Charles, to buy a bell. The verse in Leviticus reads, in full, "And ye shall hallow the fiftieth year, and proclaim liberty throughout all the Land unto all the Inhabitants thereof." Some historians believe that the inscription was meant as a commemoration and celebration of Penn's extraordinary 1701 Charter of Privileges, which put legislative power in the hands of the Assembly and took it from William Penn and the Proprietorship (those supporting the Penn family). So it would make good sense for the Assembly to pay homage to the rights granted fifty years earlier. Yet other historians pointedly note that Norris himself was known for his opposition to the Penn family (perhaps explaining why Pennsylvania is spelled "Pensylvania" on the bell). If the Bell were intended to celebrate the 50th anniversary why would it specify 1752, instead of 1751 which would have been the 50th anniversary? Perhaps, Norris recognizing that the Bell would not arrive until 1752 thought it would be curious to backdate his inscription. Or, perhaps, the fiftieth anniversary of the Charter was simply a coincidence. The historical record does not provide us an answer. Either way, agent Robert Charles ordered a bell from London's Whitechapel Foundry. The cost of the bell including insurance and shipping was 150 Pounds 13 shillings 8 pence. The Bell arrived. On September 1, 1752 Norris wrote the following to Assembly Representative Robert Charles: "The Bell is come ashore & in good order." He continued, "we have not yet try'd the sound." On March 10th Norris again wrote Agent Charles. I gave Information that our Bell was generally like & appvd of but in a few days after my writing I had the Mortification to hear that it was cracked by a stroke of the clapper without any other violence as it was hung up to try the sound. Norris went on to write that "two Ingenious Work-Men" had been hired to recast the bell. These workmen were named Pass and Stow and their names are today inscribed on the bell. After adding a dash more copper into the mixture of the Bell, the workmen were ready to try the new casting. It didn't sound good, apparently. Isaac Norris noted that "they were so teized (teased) by the witicisms of the Town that they...will be very soon ready to make a second essay." It seems they had added too much copper to the detriment of the tone of the bell. It was reported in the New York Mercury that "Last Week was raised and fix'd in the Statehouse Steeple, the new great Bell, cast here by Pass and Stow, weighing 2080 lbs. The steeple had been built in March of 1753 by Edmund Woolley, a member of Philadelphia's Carpenters' Company, and the master-builder who had overseen the construction of the State House. Pass and Stow charged slightly over 36 Pounds for their repair job. According to their bill, the Bell weighed 2,081 pounds. Not everyone was happy with the way the new Bell sounded, however, most significantly Isaac Norris. He wrote yet again to Robert Charles, "We got our Bell new cast here and it has been used some time but tho some are of opinion it will do I Own I do not like it." Norris suggested returning the metal from the Bell to England to be recast. Agent Robert Charles ordered a new bell from Whitechapel. The Assembly resolved to pay for the new bell while keeping the Pass and Stow bell. When the new bell arrived most folks agreed it sounded no better than Pass and Stow's recast Bell. The Pass and Stow Bell remained in the State House steeple. The new Whitechapel bell was hung in a cupola on the State House roof, attached to the State House clocks. It was this bell which rang the time for Philadelphians. The Pass and Stow bell rang for special events. It tolled for the meeting of the Assembly which would send Benjamin Franklin to England to address Colonial grievances. The Pennsylvania Gazette reported that the Bell was rung upon the arrival of Lord Loudon from New York. It tolled in honor of King George III ascending the throne. The Assembly permitted nearby St. Paul's Church to use the bell to announce worship until their church building was completed and their own bell installed. It tolled upon the repeal of the Sugar Act. The Bell was rung to call the Assembly in which Benjamin Franklin was to be sent to England to address Colonial grievances. The Bell was "muffled" and rung when ships carrying tax stamps sailed up the Delaware River. The Bell was rung to summon citizens to a public meeting to discuss the Stamp Act. After the ringing of the Bell, merchants of Philadelphia held a gripe session condemning regressive Parliamentary measures which included a prohibition on the manufacture of steel in the Province of Pennsylvania as well as a ban on hat making. It tolled after a resolution claiming that Parliament's latest taxation schemes were subversive of Pennsylvanian's constitutional rights. It was rung to call the Assembly together to petition the King for a repeal of tea duties. People living in the vicinity of State House petitioned the Assembly to stop ringing the bell so often, complaining that they were "incommoded and distressed" by the constant "ringing of the great Bell in the Steeple." Shortly after the Boston Tea Party (12/16/1773), the Bell rung the news that the ship Polly was bringing "monopoly" tea into Philadelphia. At this time the Assembly resolved that Captain Ayres of the Polly would neither be allowed to land nor bring his tea to the custom house. It was noted that the steeple in the State House was in need of repair. A muffled tolling announced the Intolerable Acts which included the closure of the Port of Boston. It tolled for a town meting whrein the citizens of Philadelphia pledged over 4,000 pounds in aid for the suffering residents of Boston. It pealed to announce the Battle of Lexington and Concord. The Liberty Bell did not ring on July 4, 1776 for the Declaration of Independence. The reason? The Declaration is dated July 4, 1776, but on that day, the Declaration was sent to the printer. See next. The first public reading of the Declaration of Independence. Bells tolled throughout the city on that day. Tradition holds that the Liberty Bell rang out this day. However, the steeple was in bad condition and historians today doubt the likelihood of the story. War came to the Philadelphia region. The British had won the Battle of Brandywine on September 11 and were poised to move into Philadelphia. Philadelphians tried to remove anything the British could make use of, including bells. Bells could be melted down and recast into cannon. On September 23, the State House Bell was taken down and shipped inland. A member of the Carpenters' Company was put in charge of the physical removal. The bell was hidden in the basement of the Zion Reformed Church in Allentown (where you can visit today). On its journey, the Bell was guarded by Colonel William Polk of North Carolina who was in command of 200 North Carolina and Virginia militiaman. The Bell was brought back to Philadelphia but not rehung. The rotten steeple didn't allow it. The Bell was put into storage for seven years. Some believe the Bell was stored in one of the munitions sheds that flanked the State House. The State House steeple was torn down. The Bell was rehung in the rebuilt State House steeple. The Bell was rung upon ratification of the Constitution. It was rung throughout the year to call students of the University of Pennsylvania to classes at nearby Philosophical Hall. Tolled at death of Franklin. Rung during the inauguration of John Adams. Tolled at the death of Washington. Pennsylvania's state capital moved to Lancaster. The Bell remained in Philadelphia and was used to call voters, to celebrate patriotic occasions, and to toll on the deaths of famous Americans. Tolled at the death of Hamilton. The state of Pennsylvania announced its intention of selling the State House and yard. When it was learned that the yard was going to be subdivided for building lots, the city of Philadelphia was scandalized. It responded by purchasing the building and yard from the state for $70,000. Philadelphia City Councils (there were two at the time) bought a new bell to be used for the clocks on the State House. The Liberty Bell would remain on the fourth floor of the brick part of the tower. Bell rung for Lafayette's triumphant return to Philadelphia. A letter to the Philadelphia Public Ledger on May 4, 1915 (nearly 100 years after the event) claimed that the Bell cracked on this occasion. There was no mention in the contemporary press that the bell cracked at that time, however. Tolled at the deaths of John Adams and Thomas Jefferson (both of whom died on July 4). Philadelphia decided to reconstruct the State House steeple. Council also decided to replace the State House clock with a new one in the steeple. It was decided the new clock should have a new bell. A foundry owner named John Wilbank cast a 4,000 pound bell. In December, Wilbank's bell took the place of the old State House Bell, and the Liberty Bell was moved to a different part of the new tower. The bell that was installed as a clock bell in 1821 disappeared -- It's assumed that Wilbank took it as part of his payment. Wilbank was also supposed to haul away the Liberty Bell at that time. The city sued Wilbank for breach of contract -- because he did not take the Liberty Bell with him. Wilbank argued that draying (hauling) costs exceeded the $400 the Bell was assessed at. They haggled in court before a judge ordered a compromise: Wilbank would pay court costs; the City had to keep the Bell, which was technically considered "on loan" from Wilbank. Over the years, Wilbank's heirs have agitated the city of Philadelphia to give them the Bell which they considered rightfully theirs. In a 1915 agreement, the family agreed to keep the bell on loan as long as it hung in Independence Hall. In 1984, an heir of Wilbank named James McCloskey claimed the Bell for himself, noting that it had moved to a pavilion a block north of Independence Hall. He claimed that he wanted to display it in his hometown of Baltimore, or barring that, melt the Bell down "and make seven million rings -- all cracked -- and sell them for $39.95 each." Rung to celebrate the Catholic Emancipation Act. A newspaper article from 1914 claims the Bell cracked on this occasion. Again, the story was written nearly 100 years after the event. There was no mention in the comtemporary press that the bell cracked at that time, however. City Councils agree to let the youths of the city ring "the old State House Bell" on July 4th. Rang for the Centennial birthday celebration for George Washington. In an interview in the Sunday New York Times of July 16, 1911, one Emmanuel Rauch claims that when he was a boy of 10, he was walking through the State House Square on Washington's Birthday when the steeple-keeper, Major Jack Downing, called him over. Rauch, along with several other boys were asked whether they wanted to ring the Bell in honor of Washington's Birthday. The boys started the ringing, and after the clapper had struck about a dozen times, both the lads and Major Downing noticed a change in the Bell's tone. Upon examining the Bell, they discovered a hairline crack, over a foot long. Major Downing sent the boys on their way. Long-believed to have cracked while tolling for John Marshall, who had died while in Philadelphia. However, this is historically questionable. The Bell was used as a frontispiece to an 1837 edition of Liberty, published by the New York Anti-Slavery Society. William Lloyd Garrison's anti-slavery publication The Liberator reprinted a Boston abolitionist pamphlet containing a poem about the Bell, entitled, The Liberty Bell, which represents the first documented use of the name, "Liberty Bell." Muffled and rung upon the death of William Henry Harrison. 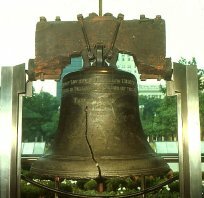 The most famous crack in history, the zig-zag fracture occurs while the Liberty Bell is being rung for Washington's birthday. The Philadelphia Public Ledger takes up the story in its February 26, 1846 publication: "The old Independence Bell rang its last clear note on Monday last in honor of the birthday of Washington and now hangs in the great city steeple irreparably cracked and dumb. It had been cracked before but was set in order of that day by having the edges of the fracture filed so as not to vibrate against each other ... It gave out clear notes and loud, and appeared to be in excellent condition until noon, when it received a sort of compound fracture in a zig-zag direction through one of its sides which put it completely out of tune and left it a mere wreck of what it was." Some historians believe that a squabble over money led to this final crack. Christ Church claimed an exclusive priviledge of ringing the bells on Washington's Birthday, as that was the church Washington was affiliated with while he lived in Philadelphia. The city paid the church a $30 bell-ringing fee for "service to the illustrious dead." However, in 1846, it seems other churches wanted in on the action. Why should Christ Church get all the money and glory? The debate was played out in the newspapers. Ultimately it was decided to press the Liberty Bell into service and discontinue paying for patriotism. The Bell was brought down from the steeple and placed in "Declaration Chamber" of Independence Hall. Bell traveled by train to New Orleans for a World Industrial and Cotton Exposition and to help foster national unity. Bell traveled to Chicago for World's Fair. Bell traveled to Atlanta for the Cotton States and Atlantic Exposition Exposition. Bell traveled to Charleston for the Interstate and West Indian Exposition. On its way there, it was involved in a train wreck. Bell traveled to Boston to take part in a celebration of the Battle of Bunker Hill. Bell traveled to St. Louis for the Louisiana Purchase Exposition. Procession through the streets of Philadelphia to celebrate Founders Week. City officials were initially reluctant to send the Bell on this trip because they thought all the recent traveling and handling had damaged the Bell. Newspaper editorials across the country weighed in on the pros and cons about moving the Bell. Ultimately a petition signed by several hundred thousand school children helped sway Philadelphia officials to allow the Bell to travel. The Bell traveled over 10,000 miles on the San Francisco trip, stopping in many towns and cities along the way. Vibrant, patriotic crowds greeted the Bell waving flags, blowing whistles, with brass bands, and gun salutes. Enthusiastic Philadelphians welcomed the Bell back upon its return to Philadelphia. It was the Bell's final rail journey. Justice Bell (today at the Washington Memorial Chapel, Valley Forge) is a 2000-pound replica of the Liberty Bell, forged in 1915 to promote women's suffrage. It traveled the country with its clapper chained to its side, silent until women won the right to vote. On September 25, 1920, it was brought to Independence Hall and rung in ceremonies celebrating the ratification of the 19th amendment. Mounted on a truck and driven through the streets of Philadelphia for a WWI Liberty Bond sale. To help celebrate the 150th anniversary of Independence, it was decided that the Liberty Bell should help usher in the New Year with a ceremonial tap. Microphones were placed round the Bell, and at midnight it was struck with a specially designed mallet by the mayor's wife. D-Day: The Bell tapped with rubber mallet twelve times by Philadlephia Mayor Bernard Samuel during a national radio program to symbolize "Independence." At the show's end the Bell was tapped seven times to symbolize "Liberty." Tapped on the first anniversary of the Berlin Wall to show solidarity with East Germans. 12:01 A.M. To help celebrate America's Bicentennial, the Liberty Bell was moved from Independence Hall to a pavilion across the street on Independence Mall. The Pavilion which allows visitors to view the Bell at any time during the day was designed by Mitchell/Giurgola and Associates. The National Park Service instituted a "fee demonstration program" at three less-visited locations in Philadelphia. It is speculated by people in the know that the ultimate plan is to impose visitor fees at the Liberty Bell and Independence Hall. Plans are being considered for development of the mall area, which includes moving the Liberty Bell closer to Independence Hall. Read the details from the NPS. The new Liberty Bell Center (see 2 above) comes under a blistering attack when it is revealed that the President's House in Philadelphia, used by Washington and Adams from 1790-1800, had slave quarters right where the entrance to the new Liberty Bell Center would be in the redesign. Historians meet to discuss the proposed Liberty Bell Center, the President's House, and the issue of slavery at the site. The Park Service held a public meeting to unveil the preliminary site design for its treatment of the President's House, adjoining the Liberty Bell center, in Philadelphia. About 10,000 people (according to the Philadelphia police) participated in an Anti-war rally at the Liberty Bell. Avenge The Ancestors Coalition protests prior to the opening of the new Liberty Bell Center, demanding a marking in the pavement 5 feet from the entranceway the location of slave quarters President Washington had built. The new Liberty Bell Center, costing $12.6 million, is opened to the public. To commemorate the 60th anniversary of the Allied invasion of Normandy (see June 1944), the Normandy Liberty Bell was cast. It is a reproduction of the Liberty Bell, made from precision measurements � without the crack. Now, we can hear how the bell was intended to sound! The project was a collaborative effort, using the best technology available, with the cooperation of the National Park Service.